Creator & Principal, Art In Canada Inc. Promoting artists online since 1999. Most of us have seen the Hollywood depictions of the Wild West, with gunslingers robbing stagecoaches, Cowboys and Indians carving out their way of life, and pioneers struggling to make the desolate prairies their new home. Many hardships would have to be endured; bone chilling cold winters in lonely isolated rural areas, where horses were the mode of transportation and living was about survival, and those who were tough enough to endure, survived. Western Canada, more commonly known as ‘the West’, is a region of Canada that includes four provinces. British Columbia, Alberta, Saskatchewan and Manitoba. British Columbia is culturally and geographically distinct from the other parts of Western Canada, and often referred to as ‘the west coast’ while Alberta, Saskatchewan and Manitoba are grouped together as the Prairie Provinces and most commonly known as ‘the prairies’. Some artists continue to depict our Canadian Western heritage of the prairie’s, and some embrace our Canadian history, preserving our culture through their work. Other artists paint our landscapes and our way of life as it is now, as they see it and how they live it. People of Canada’s prairie west love that real, rural subject matter of life on the ranch or farm. They can relate to the fact that nothing is ever completely done. Because of this, they have an ‘awareness’ of their surroundings, which is unique to their way of life. It’s all about storytelling, and no two artworks are ever alike. These prairie artists do share a passion. They share camaraderie. They share their love for the outdoors and the livestock, the close ups and the distant miles, the round bales in the field, and the cowboy riding a bucking bronco in the rodeo. Painting what they see. Horses in the field, their thick winter coats topped with an insulating layer of freshly fallen snow. The cattle in the porcupine hills grazing in the grasslands with unobstructed views, and the winding creek meandering though the farmer’s field bringing fresh water to them naturally. There is no lack of inspiration for an artist’s eye, and the nature that surrounds them provides endless moments for the mind to capture. From furry prairie animals peeking out of their holes, to abandoned homes and barns alone in the field, left by our pioneers. Western Canada has a character all its own. Western Artists know this and it comes through in their paintings, sculptures and many other mediums. Inspired by the life that they are living on the prairies. It appeals to others who don’t know the lifestyle, because the art encapsulates the romance of daily prairie life. To live this life is to love this life, and these artists clearly love their lives. If you ever have the chance to see the ‘Greatest Outdoor Show on Earth’, the Calgary Stampede, don’t pass it up. You will experience Western culture and art at its finest in the Western Artists Salon. This art exhibition and sale is a destination for many discerning Western art collectors from around the world. There is more to be said about western Canadian artists. They paint much more than horses, cattle, life on the ranch, and rodeo. There is so much diversity here with our great western Canadian landscapes, native cultures, towns, waterways, and wildlife. The Canadian west is made up of land as far as the eye can see beginning in the prairie provinces of Manitoba and Saskatchewan. These prairie artists are famous for paintings of big colorful skies, grain elevators, trains rumbling across the landscape, and bales of hay left temporarily in the fields. West of Saskatchewan we have Alberta, a province that will take you through all kinds of scenery as you drive from the north to the south. You will pass dense forest, hills and valleys, oil industry, and cattle country with rolling grasslands. In Alberta you will find one of Canada’s most painted and recognized natural creations, the majestic Rocky Mountain range. These mountains were famously depicted by the Group of Seven. This group of seven painters was formed in the 1920’s to capture the beauty of the Canadian landscape, while so many were painting the hardships and rural life, these paintings were about the majesty, opportunity and big Canadian dreams. You could say that these idealized paintings created western Canada’s tourism industry. Beginning with the mountain towns of Jasper, Banff, and Canmore; attracting curious tourists year round. The Prairie Provinces are hued with tones of golden yellow and big blue skies, while the coastal west of British Columbia is all about the greens of the forests and the deep blue-greens of the Salish Sea and Pacific Ocean. The west coast includes island chains and vibrant rural arts communities. Here, the very first artists of Canada were born in Haida Gwaii, where the aboriginal cultures of Canada began creating art, passing on their techniques to each generation through to modern day. The Haida produce a robust and highly stylized art form. While frequently expressed in large wooden carvings (totem poles), weaving, or ornate jewelry, they are also moving quickly into works of popular expression such as Haida manga. The Haida were the very first artists of west coast culture, wildlife, and landscapes. Our earliest expressions of art in Canada. Canadian Aboriginal art is still some of the most collected, most recognized, and most valued Canadian art in the world. Western Canada offers diversity. In scenery, in culture, and in the arts. 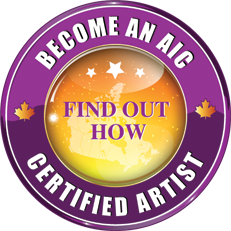 Even though Toronto in Eastern Canada is our most populous city, the largest community of professional visual artists is right here in Western Canada. The growing metropolis of Vancouver, British Columbia is currently home to the largest group of working artists. Here you will find everything from auction houses selling landscape paintings by the Group of Seven and Emily Carr, to a vibrant contemporary community painting street life, abstracts, hyperrealism, surrealism, mixed-media collage, and painterly looking photography. Canadians work hard, we are passionate and we are down to Earth and that is reflected in our art. Western Canadian Art reflects exactly what Canada is; grandness in the raw with an openness that defines our country.